I've finally gotten back to some non-baby projects and just in time with this wave of hot, summer weather! I'd been on the lookout for a loungewear style dress that could double as a nightgown for those initial days after baby arrives (when you may or may not be dressed/showered in the middle of the day, but don't want to look it) and had no real luck finding anything. So I decided to improvise this item using stuff I had on hand. The fabric is a bamboo jersey so it's still stretchy enough for me to put on for the photo. The bias tape & ribbon were from my grandma's stash of fabric stuff. The price tag on the bias tape was $0.25, so it's definitely vintage! I'd thought the fruit ribbon was so cute, but up until now had no idea how to use it. I made up the design as I went along. For the neckline & sleeve holes I just traced a top that fit well (by folding it in half on each side to make sure it was symmetrical) and then just extended the length to make it into a dress. 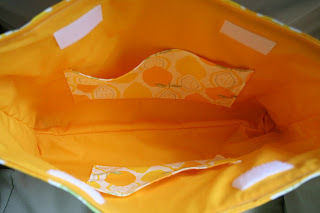 Just 2 pieces to sew, so way easy! I stitched on the ribbon to make it an empire-waist and then snaked in elastic to gather it so there would be some drape (when there isn't a bowling ball shaped belly in the way anyway). This is my sewing tip for making something look fitted and flattering without having to do much work. 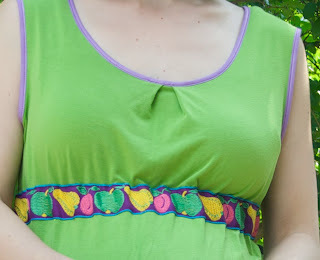 The top I used for the neckline had a drawstring, so there was a bit of a gape in the front. My solution was to fold it into an inverted pleat which is held in place with the stitches from the bias tape. 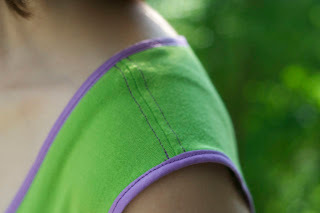 To give it a little added interest I top stitched with purple thread on the shoulders and bottom hem. It's way comfy, so I'm looking forward to wearing it - especially when it isn't stretched to the max by my stomach! 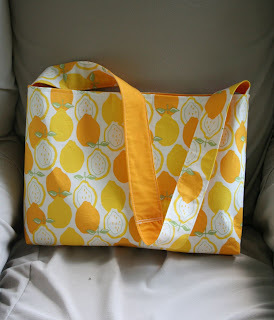 I also finally got around to making a summer tote bag with this fun lemon fabric I bought ages ago. I figured these two fit together with their "fruit theme" and I'd better do it now before summer was over. I just cut some rectangles of the fabric & lining, ironed on some interface to the lemon fabric & then square stitched the bottom corners to give it depth. Cut some strips for the strap and sandwich those in the edges before I folded in the top to top stitch it closed. I was too lazy to mess around with a zipper or flap closure, so before I put everything together, I just stitched in some velcro when I added in some pockets. Fun & functional and both projects can be done without patterns and in a short amount of time. Big wins all around! You liquid starch post will be featured on somedaycrafts.blogspot.com in the next couple of days. Thanks for adding the details in the post! Grab my "featured" button. you must have such a neat bump Cheryl, you don't even look pregnant in the back shot! Aww, what a great compliment - thank you, thank you!